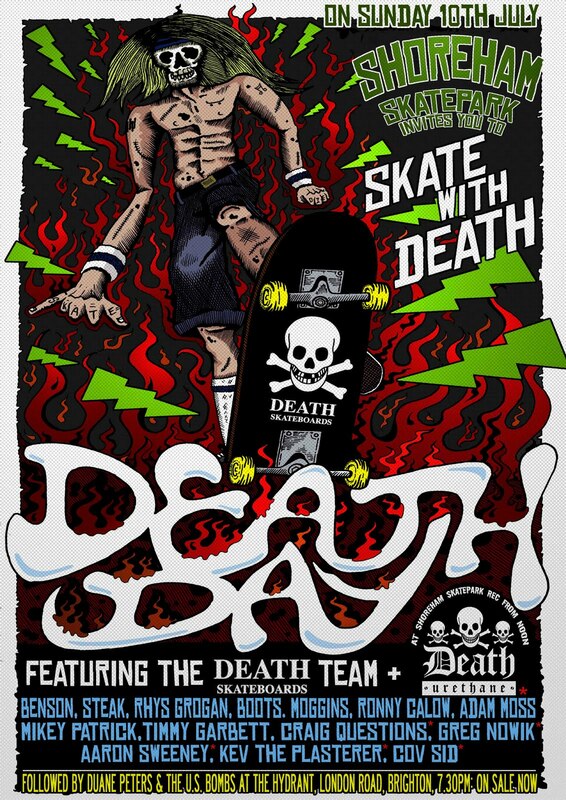 Death Skateboards have announced today that Sunday July 10th will now be christened as Death Day at Shoreham’s concrete bowl. Expect Death Skateboards and Urethane team rider to be present including Benson, Steak, Rhys Grogan, Boots, Calow, Moss, Patrick, Garbett, Questions, Nowik, Sweeney, The Plasterer, Cov Sid and various guests. This should be one hell of a session. The jam will be followed by Duane Peter’s band the U.S Bombs playing live at The Hydrant, so get your tickets in advance to avoid disappointment on the night. Spread that word.